I’m a former businessman/parliamentarian,/diplomat, lifelong conservationist and renaissance man. I’m also a dedicated family man who has a strong belief in duty, honour and responsibility. I spent a lifetime in Public Office working for a fair and just dispensation for South Africa.I have a great passion for history, foreign affairs and the ongoing upliftment of South Africa. I sincerely believe, as a custodian of our time, that the best results can be achieved by people simply working together and inspiring each other. Kent Durr. The resignation in 2005 from Parliament of Mr Kent Durr MP – diplomat, politician, amateur historian, globetrotting outdoorsman and lifelong conservationist – brought to an end a long career during which he not only saw South Africa change almost beyond recognition, but played an important part in bringing about the historic transformation. 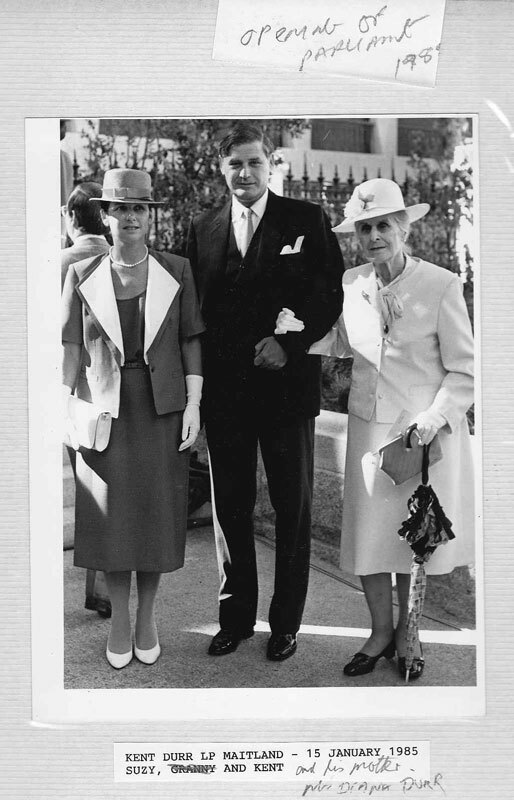 A member of an old South African family, Mr Durr was born in the Cape in 1941. His father was Dr John Durr, a well-known medical practitioner who was trained at the University of Cape Town, the University of Edinburgh and Guy’s Hospital, London. 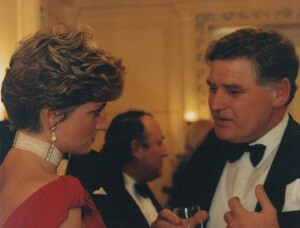 His mother was the former Diana Skelton, of a prominent London family. Mr Durr, who was educated at the South African College Schools in Cape Town and at the University of Cape Town and later also studied privately in Australia, embarked on an adventurous and multi-faceted career when barely out of his teens. 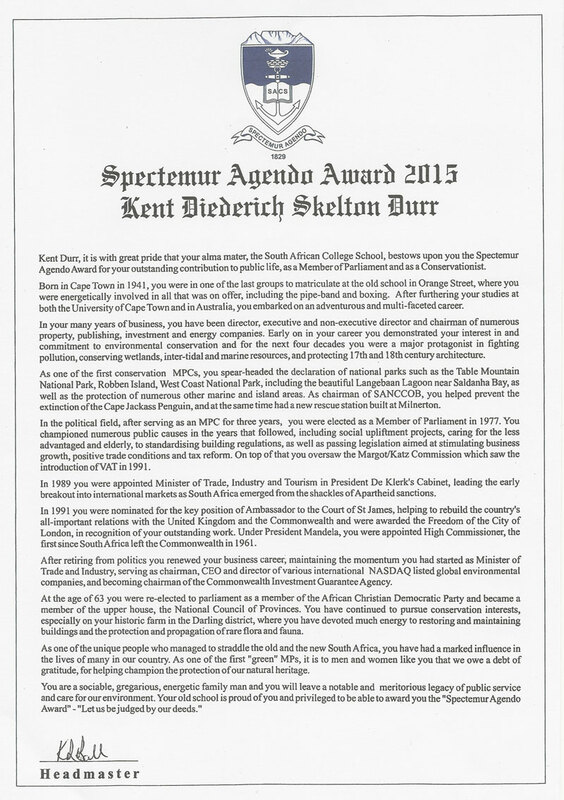 In 2015, Kent Durr was honoured by his old alma mater, The South African College School (SACS), with the presentation of the rare Spectamur Agendo award for his lifetime contribution to conservation and achievements in public life. conservation of all kinds and extreme sports. During the next four decades he was to be a prime mover in fighting pollution, conserving wetland, inter-tidal and marine resources, and protecting 17th and 18th Century architecture. From 1977 to 1984 he also served as a non-executive director of public companies – and as chairman of a building society as well as of non-profit companies as his personal contribution to helping the homeless, disabled and disadvantaged. Kent Durr joins De Klerk cabinet. In 1974 Mr Durr was elected Member of Provincial Council for Constantia. In 1977 he was elected Member of Parliament for Maitland, Cape. 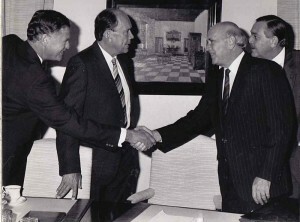 In 1989 he became Minister of Trade, industry and Tourism in the De Klerk Cabinet, swiftly building a reputation as one of the most effective ministers ever to hold these portfolios, and leading the early breakout into international markets for South African business in central and eastern Europe, including Russia. A dedicated reformer from his early days in Parliament, he was always at the cutting edge of change and reconciliation. ln the process he gained a measure of credibility with all parties which placed him in a unique position to play a meaningful role in the events following the unbanning of the African National Congress in 1990 that set South Africa on the road to its present dispensation. 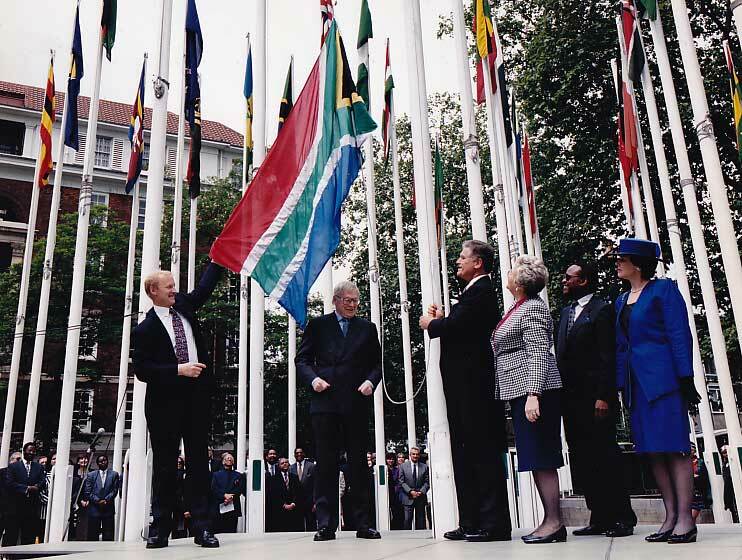 High Commissioner, His Excellency Mr Kent Durr, raises the South African flag for the first tim e at the Commonwealth Institute, to mark the return of South Africa to the Commonweath. Minister Baroness Chalker looks on along with Secretary General of the Commonwealth Chief Emeko Anayouka and Mrs Suzy Durr. Mr Durr was the first public figure to speak out and warn of the threat and impact of HIV/AIDS. In the mid-1980’s he warned society and the business community to prepare. His predictions have been remarkably accurate. 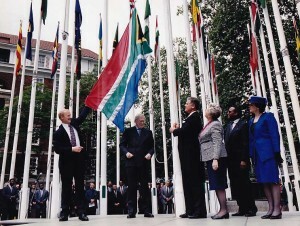 In April 1991 President De Klerk nominated Mr Durr for the key position of Ambassador to the Court of St James to represent the transformation process, and to guide South Africa back into the Commonwealth and rebuild the country’s all-important relations with the United Kingdom and the Commonwealth. Mr Durr did so with marked success, earning such respect from the British that he was made a freeman of the Worshipful Company of Vinters and in February 1991 was honoured by being awarded the freedom of the City of London. When Mr Nelson Mandela took over the presidency of the Government of National Unity after the 1994 general election Mr Durr became South Africa’s first High Commissioner since the country’s departure from the Commonwealth in 1961 (the 17th since Union in 1910). In March 1995 Mr Durr retired as High Commissioner and resumed his business career. He served as chairman, CEO and director of various international US NASDAQ-listed global environmental companies, then became chairman of CIGA (the Commonwealth lnvestment Guarantee Agency) and a director of other companies for 5 years before returning to South Africa. He had offices in London and New York and traded in 12 countries on 3 continents. Although he had not intended to resume a political career, Mr Durr was approached by several political parties and in August 1999 accepted an invitation to stand for election to parliament as a member for the National Council of Provinces for the African Christian Democratic Party, representing the Western Cape. ln 2004 he was re-elected to the House of Assembly. At the same time he continued to pursue his conservation interests, among other things buying an historic farm in the Darling district where he has devoted much of his energy to restoring the buildings and protecting the rare botanical and zoological species. During his years as an ACDP MP Mr Durr gained the respect of his fellow parliamentarians for his continuing work in fostering reconciliation and co-operation among all parlies and his general contribution as one of the most experienced representatives in Parliament. Mr Durr married his late wife Suzanne (nee Wiese) in 1966 and have a son and two daughters, Bluett, Alexandra and Kate. Suzanne died in April 2010. © 2019 Kent Durr. All Rights Reserved.